Englishman Laurence Hartnett was managing director of General Motors Holden for 13 years and is still regarded by many as the “father” of Australia’s own car Holden. But what is little known is that he started his 24-year association with General Motors selling Buicks in the east. As a young man Hartnett in the UK worked for Vickers, building First World War munitions and aircraft before being trained as a navy pilot. After the war he became involved in motor vehicle repair and used car sales and for a period had his own motor sales and service business. Times were difficult so in 1923 at the age of 25 he moved to Singapore to help manage Guthrie and Co., a trading house and motor vehicle distributor. 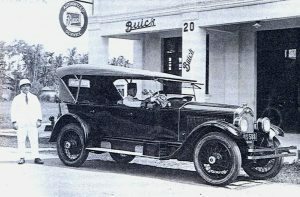 Hartnett developed the business setting up dealers through out the British Straits territories including Malaysia by capitalising on the British Empire Buick built in Canada. At the end of his 3-year contract with Guthrie’s he pursued his GM contacts for a job and became assistant to the Zone Manger of India responsible for southern India and Ceylon (Sri Lanka). He set off in a Buick tourer to organise his territory accompanied by his wife and 3 others. They covered 4,000 miles in 3 months. In 1927 he was transferred to the New York and Detroit before being posted to Sweden as Sales Manager and was acting MD for some time during the construction of the new Stockholm assembly plant to assembly Buicks and other GM products. At the age of 30 he was appointed Export Manager for Vauxhall recently acquired by GM. He became a world traveller and his success building exports sales led to his appointment to the Vauxhall?s Board. The 35 year old Hartnett moved to Australia in early 1934 as managing director of GM Holden’s, where for the next 13 years he lead the company through a period of strong growth, a major war effort and the early development of Australia?s first volume production car, the Holden. During this period Buick consolidated it’s position as the top selling premium/luxury car in Australia. The late Peter Burden, a highly regarded motoring journalist with the Financial Review and Wheels magazine once said Buick had the same status in the pre and post WW2 period as that achieved in Australia by Mercedes Benz in the 1980’s and 90’s. During 1947 with the Holden program well under way Hartnett was asked to move on in the GM organisation. One option for the 49 year old was Vice President of Buick Motors. However he declined, not wanting to uproot his family and leave Australia or Holden before the new car was launched. Disappointed he resigned from GMH and to start up his own car making business. While this was not successful his association with importing Japanese vehicles was, and kept him involved in the industry for many more years. Sir Laurence was knighted in 1967 for his services to Australian industry. He was guest of honour when the 4 millionth Holden rolled off the line in 1981. He died in 1986 aged 88 years.